KUWAIT: At its Annual Shafafiyah ‘Transparency’ Investors’ Forum, KIPCO – the Kuwait Projects Company (Holding) – said that it was guardedly optimistic that the growth trend achieved in 2018 would continue through to 2019. At the company’s investors’ forum, KIPCO presented a review of its activities in 2018 and its outlook for 2019 to an audience of shareholders, financial analysts and institutional investors. The forum followed the company’s General Assembly meeting where KIPCO’s shareholders approved a cash dividend of 12 percent (12 fils per share). As part of its review of 2018, KIPCO highlighted the 13 percent growth in revenue in 2018, as well as the 20 percent increase in net profit compared to 2017. In the past year, KIPCO continued to enjoy strong investor confidence, as reflected in its KD 100 million five-year bond issuance. The company maintained its investment grade rating, and made a new real estate investment together with partners worth KD 90 million in Khabari in southern Kuwait. As for KIPCO’s landmark residential and commercial project, Hessah Al-Mubarak District, 80 percent of the plots are now being developed by Group companies or third parties. KIPCO highlighted the performance of its main operating companies. Burgan Bank registered a 27 percent increase in net profit and completed a rights issue to raise KD 62.6 million in equity. For Gulf Insurance Group, gross written premiums (GWP) increased 10 percent, while net profit was up 18 percent. The company continues to be among the top five insurance companies in the Middle East in terms of GWPs. United Gulf Holding recorded its twenty-eighth year of operational profitability, with net profit up 46 percent. 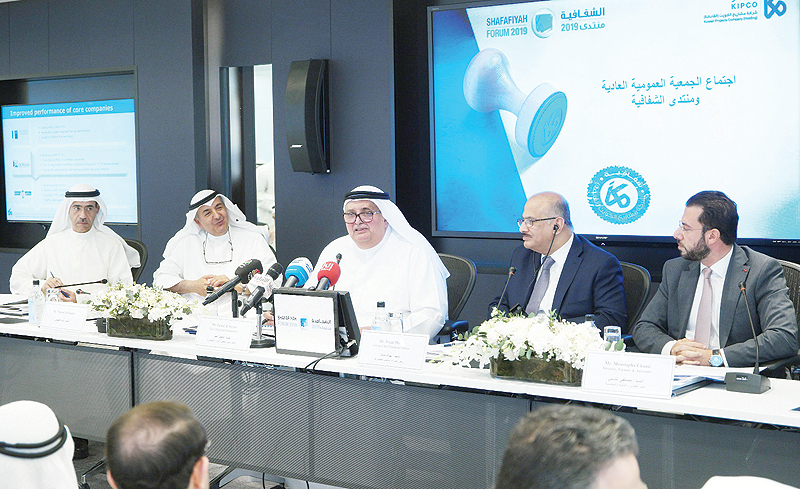 It’s subsidiary, KAMCO Investment, issued a KD 40 million five-year bond and completed the acquisition of a majority stake in Global Investment House. KIPCO’s real estate arm, United Real Estate, issued a KD 60 million five-year bond, and its gross profit recorded a 6 percent increase. Qurain Petrochemical Industries (QPIC), meanwhile, registered a 7 percent growth in revenue for the first nine months of the financial year, and its dividend yield on portfolio companies increased 11 percent. SADAFCO, a subsidiary of QPIC, acquired a 76 percent stake in the Polish dairy producer, Mlekoma.